The following rules describe terms and conditions of the online shop www.bras4you.com based in Wasilków, postal code 16-010, 1 Staszica St., Poland. NIP (Tax Identification Numer): 966-011-78-59. BRAS4YOU®.COM, hereinafter referred to as “the Shop”, sells goods online. Orders can be placed by Customers through the Order Form available at www.bras4you.com. Customers are required to read and accept the following rules of the Shop before closing the deal, and to agree for processing their personal data by the Shop for the purpose of delivery of an order. Customers’ personal data are not shared with any 3rd parties for commercial purposes. Placed order is a sale and purchase agreement as defined in the Polish Civil Code. Orders are accepted 24 hours a day, 7 days a week, every day of a year (placing and delivery of orders may be unavailable at times due to maitenance work on the website). Orders are processed on weekdays (except of the public holidays) within 3 business days from the date of placing an order by Customer or from the moment the Shop collects all products ordered by Customer, and/or from accounting the payment by the Shop. Placing an order is equivalent to adding products available at the Shop to cart by filling out the Order Form according to the information provided in this Form. Customer can also place an order by e-mail or instant messenger. Once an order has been placed, Customer will receive a confirmation of the order acceptance by e-mail. Confirmation e-mail provides Customer with the following information: list of selected products, the delivery address, total order value, mean of payment, and shipping method. In case of not receiving this information, Customer shall contact the Shop by e-mail. Failure to confirm the order may result in its cancellation. When placing an order, Customer is required to provide information about themselves that is accurate and true – especially full name, e-mail address, and phone number. Providing incorrect information may result in lack of possibility to process an order. The Shop reserves the right to verify the order in case the reliability of Customer raises legitimate concerns or to cancel the order in case the Customer fails to pay. Customer can choose one of the following payment methods: PayPal, or wire transfer directly to the bank account of the Shop. in case of paying via PayPal – after the payment is authenticated. Payment is due within 14 days. If payment is not received by that time, the Shop may cancel the order immediately. Should some ordered items not be in stock, Customer shall be informed about the state of the order by the Shop and they make decision on the way of its realisation (partial realisation, prolongation of time of expectancy, annulment of total of order). If no reply is received from the Customer within 3 days, the Shop shall ship available products or cancel the order. Delivery time includes time of order execution and shipping time, which mail or courier needs to deliver the delivery to Customer. Time of delivery includes business days only (Monday to Friday). on the day of dispatch, Customer is informed by e-mail that their order has been shipped. All products available in the Shop are brand new, free from physical and legal defects, and were legally placed on the market. Limited number of goods is destined to promotional and clearance sale. Realisation of orders follows accordingly to the order of receipt of confirmed orders of goods. In case the ordered product has run out – the Shop may ship incomplete order or cancel the order. All prices listed on the website are gross prices in USD (they are inclusive of VAT – value-added tax). The prices do not include shipping. The Shop issues an invoice upon Customer’s request. Customer can annul their placed order through the Contact Form until the order has been processed and is being prepared for packing. In case of orders consisting of several items that will be delivered in a single package, the date of delivery will depend on bringing in all the items to the Shop, unless the Shop and Customer both decide otherwise. Delivery of an order shall take place by transporting the ordered items to the address specified by the Customer by a professional forwarding company, e.g. Polish Post or a courier company. Shipping fees will be added to the total cost of each order in accordance to the shipping cost table. According to the Polish Civil Code, in case the sold item was delivered by a carrier, Customer shall check the condition of the delivery while picking it up. In case of damaging or a defect of the ordered item, Customer shall draw up the damage protocol in courier’s presence and immiediately inform the Shop about this fact. The damage protocol shall state the condition of the consignment and the circumstances in which the damage or shortage of the item occurred. The protocol shall be signed both by the courier and the delivery recipient. In the event of termination of the agreement, the agreement is considered unconcluded. The Shop shall reimburse all received payments to Customer, including the costs of delivery (with the exception of the supplementary costs resulting from Customer’s choice of a type of delivery other than the least expensive type of standard delivery offered by the Shop) as soon as possible, but in any event not later than 14 days from the day the Shop was informed about the Customer’s right of termination of the agreement. If the Customer chose the type of delivery other than the least expensive type of standard delivery offered by the Shop, the Shop shall not be obliged to reimburse the supplementary delivery costs to the Customer. Purchased goods may only be returned if they bear no signs of use, they are complete, and they were not damaged in any way. Customer shall be liable for diminished value of the goods if they used the goods for a purpose other than the goods were originally intended for. The goods that the Customer wants to return shall be packed in such a way as to guarantee the security of the items, keeping in mind the need to avoid any damage in order for the goods to return to the Shop intact. The Shop has the right to refuse acceptance or exchange of the goods, if they were damaged during transport. Along with the purchased goods, the Customer must also return all the products that they received free of charge. Returning the sales note along with the items would be appreciated. Return of goods to the Shop shall be effected without delay, not later than within 30 calendar days. The Customer must bear the costs of returning the goods. The Shop takes all the efforts to make the descriptions of the products presented on the website factually correct. In case of any doubt, please contact the Shop before ordering through the Contact Form. The Shop is committed to protecting Customers’ personal data in accordance with the Personal Data Protection Act of 29 August 1997 (Official Journal from 2009, No. 133, item 883). According to the law, Customer has the right to access their personal data, change it and request the Shop to stop using it. In the event of an order exchange because of the incorrect order execution by the Shop, the Shop shall pay the delivery costs of the right product (limit to the amount of money is 10$). The Customer shall pay the delivery costs of the product they want to return to the Shop. In case of any mistake, the Shop shall return the money for the shipping costs to the Customer in accordance to the costs presented on the consignment note. The Shop does not accept any deliveries sent back, paid on delivery. In the event of the order that has been already paid for – if the Shop is not capable of processing the entire order, the Shop will inform Customer about this fact. 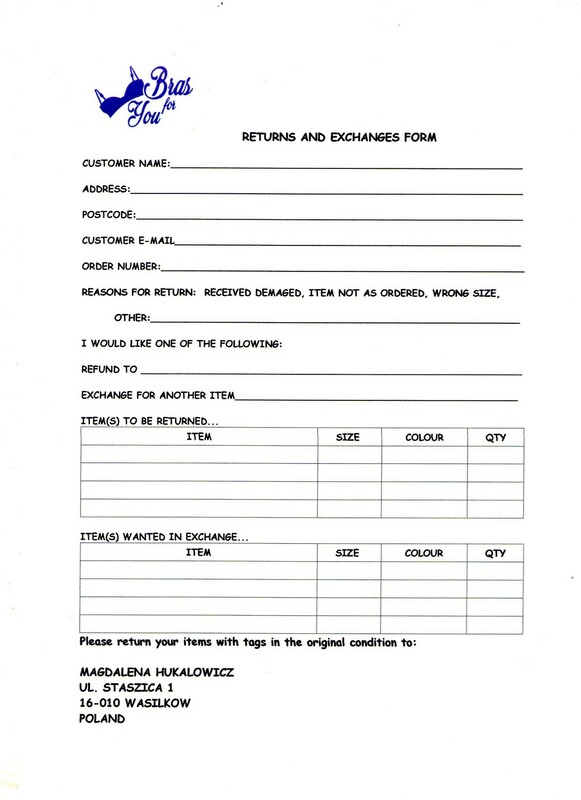 In case the Customer does not want to receive particular items or the entire order, the Shop shall return the pre-payment to the Customer’s bank account or their credit card (if the Customer paid by card for the order) within 3 business days from the date of the order annulment or its amending. The information contained in this publication does not constitute an offer as defined in article 66 of the Polish Civil Code but are in the form of invitation for purchasing, according to the article 71 of the Polish Civil Code. These terms and conditions shall be governed in accordance with Polish substantive and procedural law.